One of the most critical aspects of cannabis cultivation is sometimes one of the most overlooked: maximizing a strain’s potential by harvesting plants at the peak of their psychoactive powers. 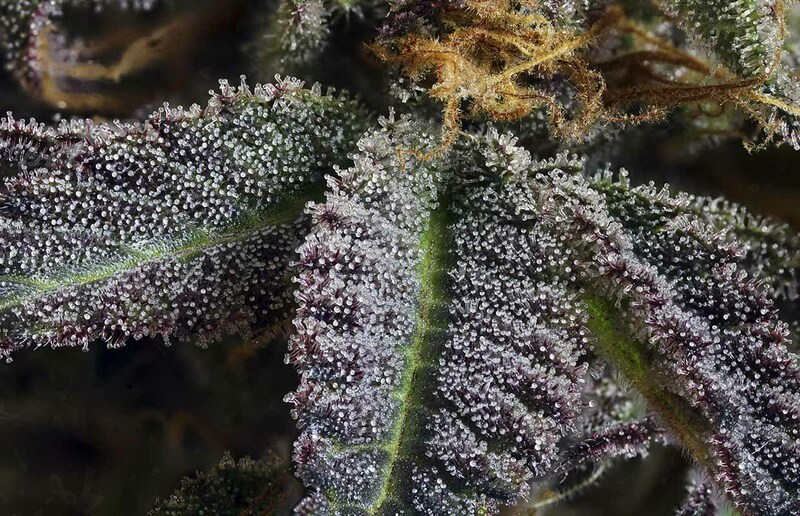 The most straightforward way to make this determination is to use macro imagery to closely examine trichomes – the tiny, crystal-like, external glands that cover the buds – while in the final days of flowering. Trichome color not only signals optimal harvest time, but allows growers to harvest a plant based on the desired psychoactive effects. Some growers check trichome status with a common microscope. Others use a microscope lens adapter for smartphones, or a USB microscope for viewing digital images in real-time on a computer screen. Then there are those who go through the painstaking but rewarding process of capturing trichomes with macro photography, creating some of the most intimate images of cannabis available. “Macro images take specialized gear. Most use DSLRs and specialized lenses,” says renowned macro cannabis photographer Jeff Scheetz of DoobieDuck Macro Cannabis Imagery. To achieve quality macro shots, he says the most important factors are stability and lighting. Scheetz usually uses a Canon body and MPE 65mm macro lens, along with a StackShot focusing rail for layering multiple photos taken at different focus distances into one crystal clear image. Trichomes range in color from clear to translucent to amber. Clear indicates precursor cannabinoids that are not yet psychoactive. Amber signals THC that’s past its prime. Milky translucent represents the ‘Goldilocks’ zone, when THC concentration is at its peak. Bud trichomes’ optimal harvest can range from mostly translucent and a few amber, to half-translucent and half-amber — but ultimately the decision depends on the strain and the type of high one hopes to achieve. As a rule of thumb, harvesting on the early side – when most trichomes are cloudy and just a few are amber – will produce a more energetic, cerebral high, particularly with sativas. Harvesting on the later end – when many of the milky trichomes have turned amber – will create more of a body stone, tending toward couch-lock with indicas. TELL US, are you interested in learning how to take better shots of your cannabis?